With over 100 weddings in our back up files I had plenty to choose from. However, I will be the first to say up front; I am no style expert. 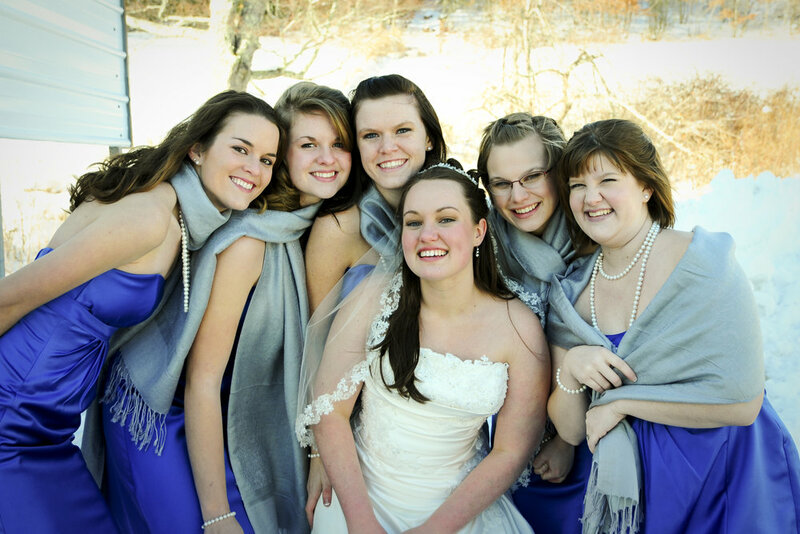 I've always been a 'jeans and a tee shirt' kinda girl and if I could re-do my own bridal party today it would actually include 5 guys and 2 girls, so there's that. I am a FIRM believer that there is no "correct" way to do anything. If you want one person on each side or twenty - do it. If you want a mixture of girls, guys and transgendered friends on both sides - do it. If you want the girls in the most exquisite gold sequin gowns and the guys in the most expensive fitted tuxedo - do it. If you want them all in hiking gear because you plan to hike up to the top of a mountain for the ceremony - do it. Don't ever let yourself feel pressured by ALLLL the opinions you will definitely receive from caring friends and family. That said, here are a few ideas. Winter weddings tend to include reds, hunter green, and black. Spring weddings use lighter colors. Think pastels and neutrals like blush, green and gray. Summer weddings tend to have bold blues, pinks and violet. And autumn brings out the oranges, browns, yellow and plum. Again, there is no such thing a a correct way. A.J. and I chose black in the middle of summer and it worked out JUST fine. As far as style of dresses, if consistency and uniformity are important to you, then you should just choose the dress you like the best and go with it. If not, I recommend choosing the color and length you want then allowing your girls to choose the top style that fits their form the best. Cover ups, jewelry, shoes, getting ready robes...the sky is the limit. Again, feel free to make them unique to the girl or exactly the same. If keeping it uniform I find couples like to purchase the matching items and give as a gift. (this goes for the fellas with socks and ties and cufflinks as well). Don't feel like you have to have a flower girl or ring barer. (They are often hard to wrangle throughout the long day anyway). If you want to though, they can make for cute photos. Well trained dogs are fun too. At the end of the day, these are just details. Just remember to enjoy the process, choose those you love the most to celebrate this time and plan to have a blast, it's going to be one of the most memorable days of your life!